"Faust, I will follow you wherever you go." "Faust, I will follow you wherever you go." The above info came from Tiffany Wiseman, and was edited by yours truly (contact me). The image came from Komichi (Imageshack). 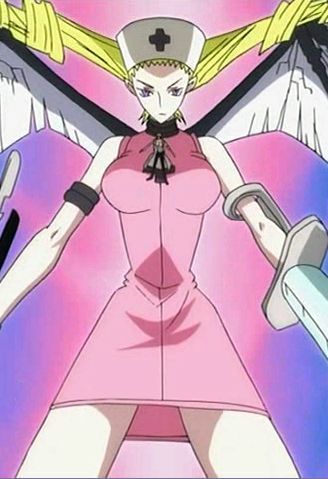 Eliza is Faust's deceased wife and guardian spirit. She adored him in life and even worked in his new clinic after they married. But when she was murdered, her husband became insane, and after learning his ancestor's Necromancy he dug her skeletal corpse from the grave to revive her, though it was only for short periods of time. He keeps his wife's skeleton under his trenchcoat until he needs her in a Shaman Fight. Faust uses his furiyoku to reanimate the skeleton, which uses a scythe as her weapon. But when he fills her with 100% of his furiyoku, she morphs to her emotionless nurse form and increases her mastery with the scythe. Some of Elisa's soul remains in the skeleton as she saved Faust when he was defeated unofficially by Len. The above description came from Tiffany Wiseman and fractyl2, and was edited by yours truly (contact me). Faust learned to create a giant oversoul, it being titled Mephisto E. Mephisto is short for Mephistopheles, which was the devil whom tainted Faust the First in the original novel by Goethe. The E, of course, stands for the E in Eliza. Faust explains Johann Faust was born in Germany in 1478. He was a philosopher, a seeker of arcane knowledge. He was learned in many disciplines, yet he lamented his ignorance. At last in frustration, he turned to alchemy and the black arts and he then traded his immortal soul to Mephistopheles, Prince of the Underworld for all the knowledge of the world. 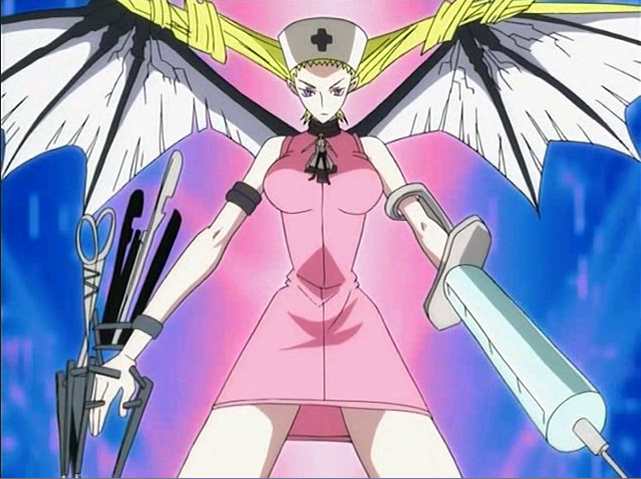 Her new large form has transparent bat-like wings, with a large syringe on her left arm, and a various amount of medical tools on her right. Other than the bat wings, Mephisto E has accessories like scalpels, probes, forceps, and a syringe. Oddly enough, while most of the other characters ride on their Giant Oversoul's shoulders, Faust and company stand on Eliza's breasts. Anna later uses her Shamanic Abilities as an Itako to revive Eliza to some extent, which caused Faust to team up with Yoh in the team "Funbari Onsen" after the fiasco with Hao, Eliza is fully revived, and she and Faust live in the Asakura home happily. To go into further detail on Eliza's death, on the first night after living in their new home, Faust came home only to find his wife and dog dead. Eliza was far beyond being saved, seeing as how she had been shot in the skull above her left eye. Despite this, Faust tried desperately to save her, but failed. After this had happened, he resorted to the dark arts called Necromancy, that his ancestor Faust the First was famous for using. He lost a good deal of his sanity in his loneliness, but eventually succeeded in reviving her as an oversoul, the medium being her bones. The above description came from Emma, and was edited by yours truly (contact me).